In “LRP State Department Socialists Embrace New Bedfellow” (WV No. 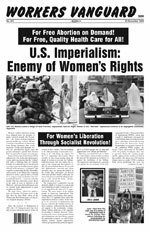 945, 23 October), we wrongly wrote that Socialist Appeal is the U.S. affiliate of Ted Grant’s International Marxist Tendency. The organization’s name is the Workers International League. Socialist Appeal is the name of their publication. For Free Abortion on Demand! For Free, Quality Health Care for All! Full Democratic Rights for Homosexuals!